Lattemiele. 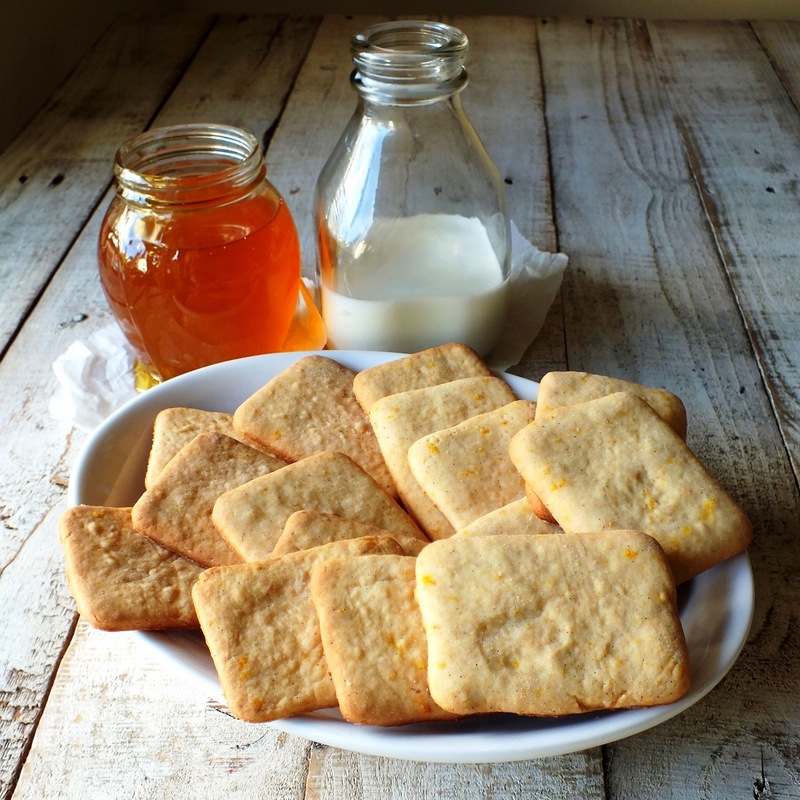 Milk and Honey Cookies. Naturally, I had to see if I could replicate or approximate them at home. The first step was to check and see if there was a recipe available online. At first, nothing came up, just a lot of reviews for the product. Then I decided to use the Italian word for recipe, which is ‘ricette’, and, as a result, I found: THIS RICETTE!! This recipe looks like a reasonable substitute, but it didn’t say anything about how to make the distinctive grooves or lines on top of the Trader Joe’s version. I don’t know if that’s a necessary part of the recipe, but it’s a distinctive thing I like about the original. Initially, I tried to run a fine tooth comb on top of each raw cookie. Bad idea. Turns out it is extremely hard not to tear raw cookie dough when running a fine tooth comb over it. So these are groove-less. (Are they not still groovy, though?) I added orange zest and the scraped seeds of one vanilla bean, so that’s why they look a little bumpy. 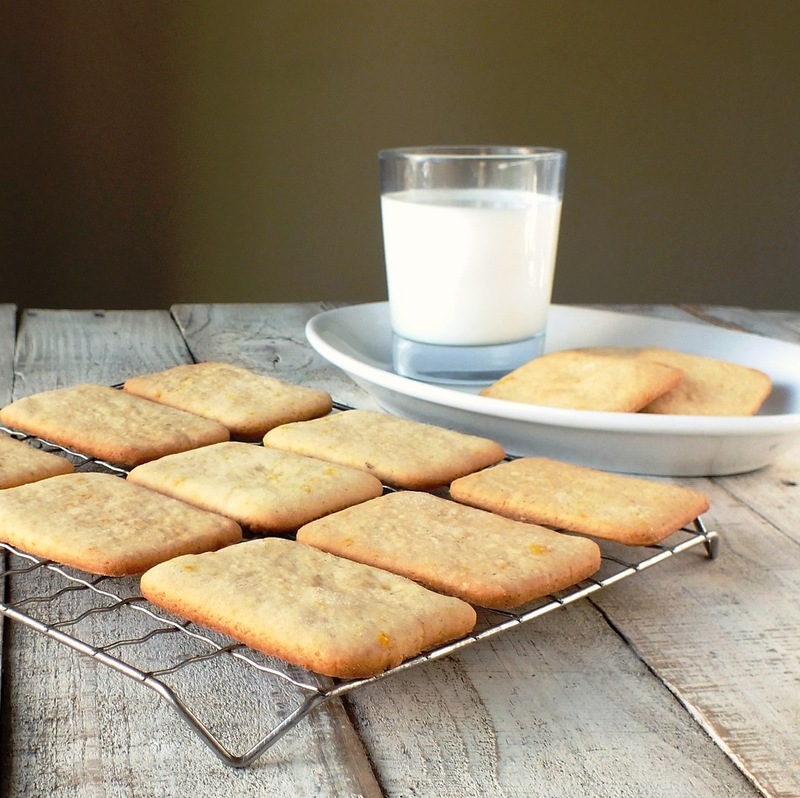 In my opinion, you really can’t go wrong by adding orange zest and vanilla to most cookie recipes. I was going to just form one large square with the dough so I could cut out rectangles, but noticed a tin box of mints by the counter in the kitchen, so I decided to use the top of it as a cookie cutter! It worked well. Incidentally, the tin box happened to also be for a TJ’s product, similar in size to a box of Altoids, but slightly smaller. The size of the tin I used was about 3″ x 2.25″, and has curves at the corners, which is similar to the cookie. If you want to make them similar in size to the original, find a rectangle cookie cutter that is 1.5″ X 2.25″. I was happy with the size I chose, though, because if I used a smaller tin, I would end up with making four dozen cookies instead of two, and that takes a special kind of patience that I seem to be lacking these days. I was happy with two dozen larger cookies, anyway. 3 Tablespoons unsalted butter, room temp. 3 Tablespoons margarine, room temp. In a bowl, cream the butter, margarine together with the powdered sugar. Add the milk, egg yolk, honey, and seeds from one vanilla bean, until all is incorporated and you have a fairly smooth soupy mixture. Into another bowl, sift the flour, salt and baking powder, and add the grated zest of one orange, then stir with a whisk several times until ingredients are well dispersed. If clumping from the moisture of the zest occurs, sift and whisk again. Make a well at the center of the flour mixture, and in the center of the well, pour the butter/milk mixture. Using a wooden spoon or rubber spatula, stir until a rough dough is formed. Shape into a disk, wrap in plastic, and leave in the fridge to rest for about an hour. With google translate, it doesn’t say to let it rest for an hour, but my dough was getting really warm and I felt it needed to get colder for easier handling and cutting. On a well-floured counter or other surface, roll dough evenly to about 1/8-inch thick. Cut out rectangular shapes (Or use cookie cutter of your choice. I used the top cover of a tin box measuring about 3″ X 2.25″). With dough scraps, simply bring together in a ball and roll out again to cut out more cookies. 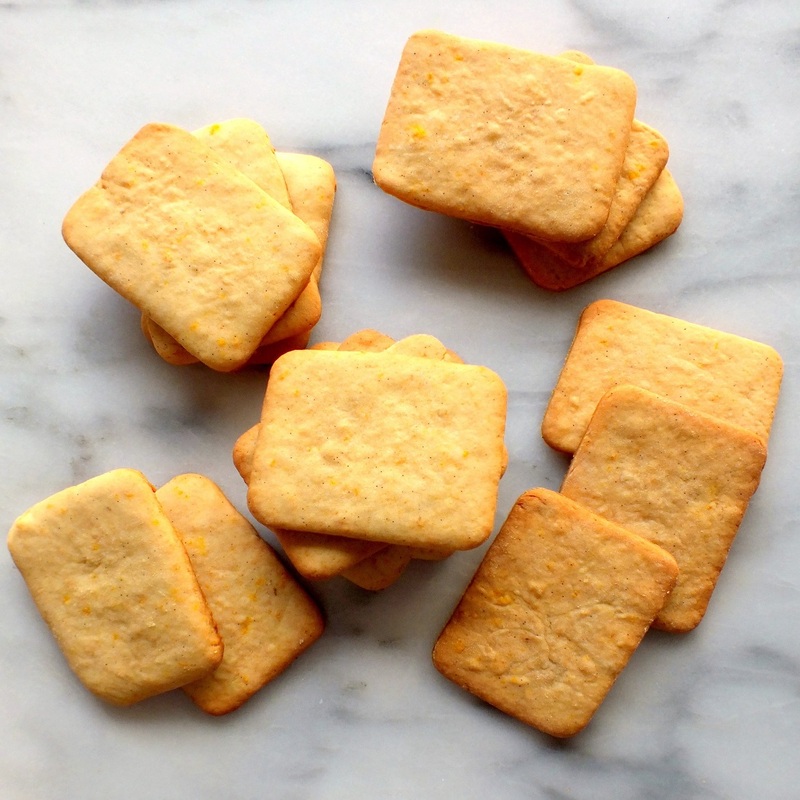 You should be able to make about 2 dozen large (3″ X 2.25″) rectangular cookies, or 4 dozen smaller ones. Ovens vary, and the thickness you roll the dough to affects the time, but generally bake around 10-12 minutes at 350 degrees F. Test a couple, if you can, to see how long your cookie might take to bake. They should be lightly browned on edges. This entry was posted in baked goods, baking, cookies, dessert, food blogging, Italian, snack and tagged biscuits, cookies, honey, lattemiele, milk, milk and honey cookies, orange zest. Bookmark the permalink. You’d need a press of some sort for the lines, if you have a long fork, that might work, or the more time consuming option would be to take a knife and “cut” an imprint into the cookie. My TJ’s doesn’t carry these, so hopefully I’ll find some time today to make them since it’s my day off and they sound good. Good suggestion! You are right. I actually used a couple of things just to try it out, and one was a plastic cutting board that was textured on the bottom. A box grater was good, but neither of those created lines. Happy baking! This must be a great cookie since you scoured the Internet to get the recipe. Using the vanilla from the pod is a sensational idea. I see the aesthetic value of the lines across the top of the cookie. Even if you scrap a comb on the top. the cookie, it will bake and fill in the gaps. Try it out. Don’t give up! Thanks for catching that, Eric! I really appreciate that. I edited in approximate time to bake, but it will vary depending on your oven and the thickness.